"Part 6 - ...end up with a terrific little road screamer." There are two Golden Rules within the CCC office. The first is that you never start writing about a project vehicle befare the very last nut has been tightened, the paint is dry, the fuel tank is full and all the photographs have been taken. The second Golden Rule in the office is that everyone breaks the rules every time. Quite simply, Project Fiesta has been a pain. One step forward, three back, about as eas/to organise as nailing a blancmange to a wall - just as messy but potentially less satisfying. No, that's not quite true. The result has been well worth it and proved that you don't have to spend a fortune to have an individual performance machine that will turn heads in car parks and away from traffic lights. Why a Fiesta 1300S? Well, the object of the exercise was to make a car that goes and looks as good as an XR2, without spending XR2 money. The whole project was budgeted at round £3000 and that included the price of the car. Any 1300 Fiesta would have been suitable, but the Sport version had the advantage of a rev counter and none of that nasty chrome stuff attached to it, collecting moisture and breeding rust. Our V-reg beauty cost £1500 is painted bright yellow - have you noticed that there are less 'bright' coloured new cars (hese days? We still like red it seems, but most new cars seem to be greys and blacks and insipid neutral colours. Shame really. Did you also know that yellow is the best colour for a car because it is seen more easily, insurance firms back that up by saying there are less claims on yellow cars? And no, they don't back that up with lower premiums. The aims of our project can be summed up thus: about 100bhp from the engine, uprated brakes to stop all that extra urge, subtle changes to the suspension, uprating the springs and changing the shock absorbers, a new wheel and tyre combination (potentially one of the most expensive bits of the whole project), topped off with new visuals, inside and out. It may surprise you to realise that at CCC, we are human - if you get my drift. In other words, just because we are who we are, does not mean that everything works out perfectly. Extracting the most from our engine, for instance, has been a problem. It's made us go full circle too. The standard Fiesta engine's major problem is in its ability to breathe. In fact, this is a comment that our Tech Ed Gerard Sauer is always trying to stress about engines. It's fair to use the comparison with an athlete to fully illustrate what we mean: to run fast, to swim fast, you have to learn to breathe properly to ensure the right amount of oxygen is pumped into the lungs regularly and at the right moments. Same goes for engines and the all-important fuel/air mixture. In this quest we approached Geoff Altham of Go-Jo in Barrowford, Nelson, Lancashire. An increase in capacity was decided upon, with the restriction of keeping a single twin-choke carburettor. We didn't want to fit any of those big, lustful, gas-guzzling expensive carburettors now did we? .... Well, we didn't at first. An increase to 1340cc was decided upon for our engine. Many are against capacity increases when searching for more power, but there's a strong argument that engines suffer much wear after long miles and reboring makes a lot of sense before further performance should be sought. In our case, the block was crosshatch honed after boring and machined in an effort to ensure it was completely fiat and would not be prone to head gasket failures at a later date. Go-Jo is in favour of having a rougher finish to the head using a fly cutter, this should mean the head will adhere better. With the block newly painted and new core plugs fitted, it is worth remembering here always to check the piston rings; too tight and you will get excessive bore wear and a loss of compression. The shells are then fitted with the balanced crankshaft, (this is the heart of any engine and mistakes here can cause massive problems latter); pistons and conrods should all be individually balanced; the big end caps were fitted all to the correct torque poundage. With the bottom end all correct, the camshaft was the nextjob. We decided to use a Kent Cams Fireball 234 camshaft, considering it to be one of the best fast road cams on the market for this engine. The valve lift is 11.16mm and a duration of 280°, it is designed to give a good usable powerband between 2000 and 7200rpm. The head itself was one of the Go-Jo Headmaster range which is available on an exchange basis. 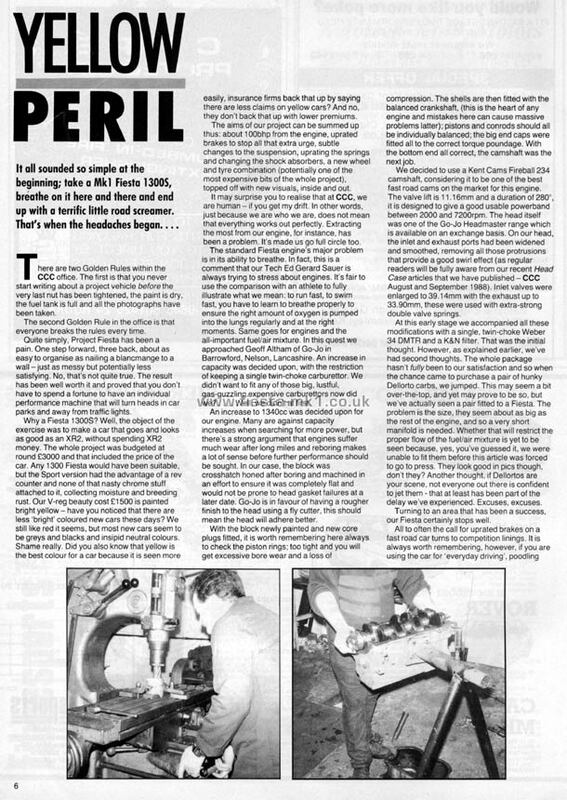 On our head, the inlet and exhaust ports had been widened and smoothed, removing all those protrusions that provide a good swirl effect (as regular readers will be fully aware from our recent Head Case anieles that we have published - CCC August and September 1988). Inlet valves were enlarged to 39.14mm with the exhaust up to 33.90mm, these were used with extra-strong double valve springs. At this early stage we accompanied all these modifications with a single, twin-choke Weber 34 DMTR and a K&N filter. That was the initial thought. However, as explained earlier, we've had second thoughts. The whole package hasn't fully been to our satisfaction and so when the chance carne to purchase a pair of hunky Dellorto carbs, we jumped. This may seem a bit over-the-top, and yet may prove to be so, but we've actually seen a pair fitted to a Fiesta. The problem is the size, they seem about as big as the rest of the engine, and so a very short manifold is needed. Whether that will restrict the proper flow of the fuel/air mixture is yet to be seen because, yes, you've guessed it. we were unable to fit them before this article was torced to go to press. They look good in pies though, don't they? Another thought, if Dellortos are your scene, not everyone out there is confident to jet them - that at least has been part of the delay we've experienced. Excuses, excuses. Turning to an area that has been a success, our Fiesta certainly stops well.